It is Birchbox Box Opening time again! :) I am sooooo excited about this month's Birchbox! For those of you who don't know, I am a bit of a health & fitness nut. I love to exercise and also enjoy healthy eating. Even with my love of health, fitness, and exercise, I still need "tiny tweaks" or just motivation from time-to-time! So, this month's Women's Health Birchbox is just the little perk that I need to re-inspire my dedication to health and fitness! I mean, we all have busy lives, sometimes we just need a little "something" to motivate us, right?!?! What is the Birchbox monthly box? Lets dive right into this box! Keep reading to find out what is inside! The Women's Health Birchbox: tiny tweaks, BIG RESULTS! What better time than Spring to shake up your health *and* beauty routine! These samples were chosen to give us all a little "boost" or tweak. Atelier Cologne | Orange Sanguine Cologne Absolue (tiny glass vial sample, full sized cost $60-$155): Okay, ya'll know that I am not a huge fan of getting these little tiny perfume samples in my Birchboxes. However, I have to admit that I am a bit stoked about this particular sample! I am slowly becoming quite a fan of Atelier's scents from my various Birchbox samples! So, I am excited to test this out. Actually, I put it on as soon as I opened the box. The scent is warm and sensual without being heavy. I am already in love! A fresh blend of blood orange, jasmine, and geranium notes, this citrus scent will keep going as long as you do. Mirenesse | Glossy Kiss Liptsick (Full Sized! Yay!!! $26.55): This is awesome! I love discovering new brands through Birchbox! I really trust Birchbox because their product and brand selections always seem to be spot-on. This brand is actually launching on Birchbox! Plus, I have been so into lipsticks lately (and chubby lip pencils in particular). This chubby pencil lipstick can be used as a cheek stain, too! It has the moisture of a balm, the shine of a lipgloss, and it is also a lipstain. Love the shade!!! Ojon | Rare Blend Oil Total Hair Therapy (small glass vial, full sized cost: $35): I am such a fan of both hair oils and the Ojon brand. So, I am always happy to see an Ojon sample in my Birchbox! This oil smells amazing! Hair oils are certainly a must for dry and damaged hair like mine. While this sample is super small, it only takes the tiniest bit of this product to make an impact with your hair. My only complaint is that these types of vials can get messy with oils. I would prefer it to have a screw top lid. This oil is a dual-phase product. So, be sure to shake it before applying oil. Supergoop! | Advanced SPF 40 Anti-Aging Eye Cream (2 ml sample, full sized cost $45): Oh cool! It is an Eye Cream with SPF!!! Honestly, I wish that all eye creams came with added SPF for daytime. I slather sunscreen on my face daily. However, I often feel that my eyes are necglected. This eye cream solves that problem! Plus, the product contains oat peptides to firm your skin. I am so excited about this sample!!! Lifestyle Extra | Kusmi Pea Paris Wellness Essentials Teas (2 tea packets, full sized cost $23.95): I love these little "treats" from Birchbox!!! I am a tea fanatic. So, I am excited to try these. Get in touch with your inner Zen master with these mood-enhancing whole leaf brews. Extra! Women's Health 1-Year Subscription!!! OMG! I am so excited about this! Honestly, I was just about to toss out this subscription card thinking it was just a random advertisement when I realized that it was for a FREE subscription! It states that there is no obligation and that you won't get any bills. Word! I have subscribed to Women's Health in the past and really enjoyed the magazine. Thank you Birchbox and Women's Health for including this Gift Subscription! I am thrilled!!! As you can probably tell, this month's Birchbox was a complete hit with me! I love the assortment of makeup, skincare, haircare, teas, perfume, *and* even a magazine subscription! How stinkin cool! This month's Birchbox is great! I have been a Birchbox subscriber for over 2 years now. I have reviewed and/or posted a box opening about each and every Birchbox that I have gotten! So, if you are curious to know how good this sample subscription is over time, please feel free to go through and read my previous Birchbox "Box Opening" posts! Here they all are: Whew! There are a lot of them. So, kick back and grab a cup of coffee and read away! Birchbox Introduction Post, Jan 2011 Birchbox, Feb 2011 Birchbox, March 2011 Birchbox, April 2011 Birchbox, May 2011 Birchbox, June 2011 Birchbox, July 2011 Birchbox, August 2011 Birchbox, Sept 2011 Birchbox, Oct 2011 Birchbox, Nov 2011 Birchbox, December 2011 Birchbox, January 2012 Birchbox, February 2012 Birchbox, and the March 2012 Teen Vogue Birchbox, April 2012 Birchbox Box Opening, May 2012 Gossip Girl Birchbox Box opening, June 2012 Birchbox, July 2012 Birchbox, August 2012 Back to School Birchbox, September 2012 Birchbox, October 2012 "Goop" Birchbox, November 2012 Birchbox, and December 2012 Birchbox, January 2013 Birchbox, Feb 2013 Birchbox, and March 2013 "March Madness" Birchbox. My fellow Birchboxers: How did you like this month's box? 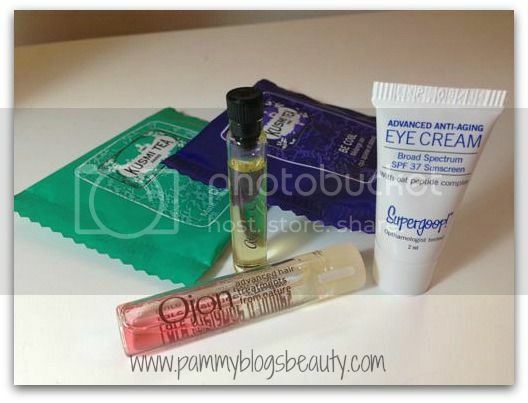 Here is a PR Photo from Birchbox with other items that might be in your "Women's Health" Birchbox. Looks like there are more great options for samples this month!! !